Alright, now that your fins are all sanded and the same shape, it's time to shape and fill them. Strictly speaking, this is not necessary, and if you're building your first rocket, you might want to just skip it. It does take some time - particularly filling the fins. But it will make your fins look much better, smoother, and will make the job look more professional. And it can even make the rocket fly better. First, you want to shape the fins so that they're more aerodynamic. A fin with a square edge creates a lot more of what's called "pressure drag." There are four forces acting on a rocket affecting its flight. There's gravity, holding the rocket to the Earth. Thrust, which comes from the motor, pushing the rocket upward. Then there's lift - this is a stabilizing force produced by the fins, keeping the rocket moving straight. Then there's drag - the effect of air molecules keeping the rocket from moving faster. Stick your hand out the window in a moving car - that feeling is drag. Pressure drag is the drag produced from air pressing directly down on the forward surfaces of the rocket. A square fin feels the pressure of the air much more than a rounded fin, or a fin with an airfoil. fin cross section creates much more drag. The Crossfire ISX with rounded fins - much better. that the "stabilizers" would fit properly. Airfoils are complicated and hard to get right, so if you are going to shape a fin for your first rocket, just round the leading and trailing edges (front and back) of the fins. The fins of the Big Bertha are oddly shaped - no space rocket would ever be shaped like this, unless you're Marvin the Martian. It's a cartoony, throwback shape, and while there's a definite leading edge, the "trailing edge" is harder to define, since the sides of the fins are at kind of an angle. So I opted to round only the leading edges. Like Der Red Max, this rocket would look fine with square edges, and it's not meant to be a high performance model. But I'm fussy about my fins. For most rockets, it's not a bad idea to round the leading and trailing edges, as it will make your rocket perform better in flight. To round the fins, use a medium fine grit of sand paper, say, 220, and a sanding block (or simply hold the paper flat against a table with your fingers - I've done that). Take the fin in one hand, and lay it with the edge to be rounded - I start with the leading edge - against the sand paper with the fin nearly flat on its side. Support the fin by spreading your fingers evenly across the whole span of the leading edge. Now, gently, gently sand the fin back and forth with a sawing motion while lifting the opposite edge upward. Just take off a little bit at a time when you begin. Then flip it over and do the other side of the same edge. At first, you'll just round off the corners. Look at the cross section of the fin often to make sure you're rounding it and not taking off too much wood, or making it pointy. Eventually, you'll get to the point where the edge of the fin is nice and round. Go ahead and do the trailing edge of the fin if you are opting to do that. Stack all your fins together to check their cross sections. You want them to be as uniform as possible. Do some touch-up sanding if necessary. What I mean by "filling" the fins is that you're essentially going to hide the wood grain and make the fins look smooth - as though they were made of plastic, metal or glass. If you merely glue on the fins and then prime and paint them, you won't hide that wood grain - in fact, you'll accentuate it. This can be done with a number of products. The first is something called sanding sealer. 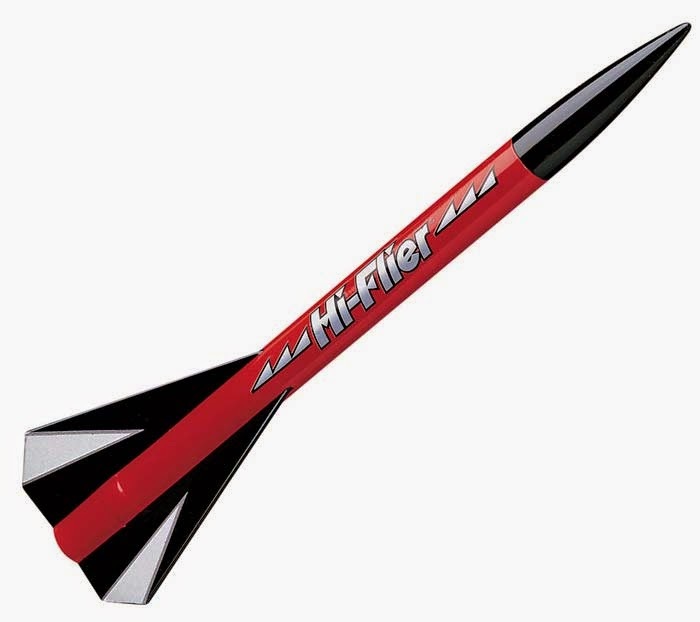 For years in model rocketry, this was the standard. But I've never used it. It seems as though most rocketeers now view sanding sealer as a bit old-fashioned. Apparently, it can gum up the sand paper pretty badly, which means you have to switch sandpaper several times. And it smells bad. And it's expensive. But I might give it a try some time, because a lot of old-timers swear by it. Another thing you can do is paper the fins. This means you apply pieces of printer paper to either side of the fins with adhesive, then smooth the paper out, trim it tight, and fit it perfectly to the shape of the fins. It works great, apparently, and takes less time, but I haven't tried it yet, so I'm not going to talk about that here. Also, the fins on the Big Bertha are kind of weird, and I think that papering is easier if you have basic, four-sided fins with all straight edges. So I decided not to try it on this rocket. What I use - and a lot of rocketeers use - is something called carpenter's wood filler - CWF for short. 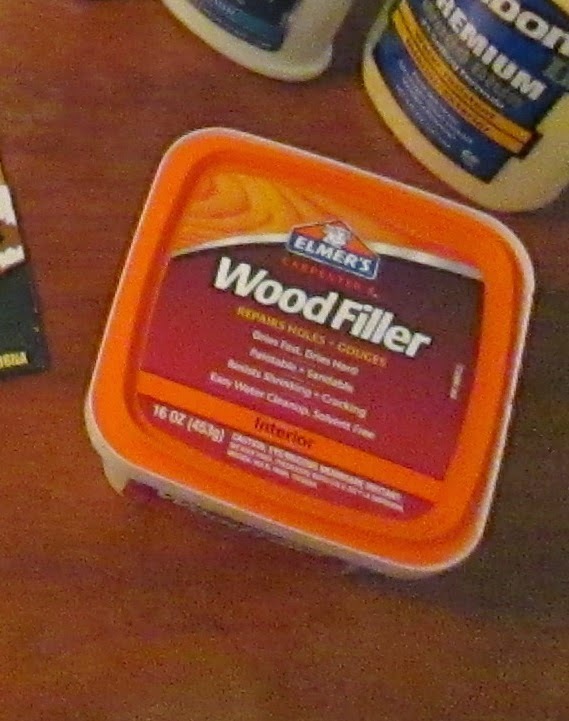 A favorite brand is Elmer's Wood Filler. This stuff is a putty used for filling gouges in woodworking. It comes in a can and looks like really thick frosting. But you can thin it with water, which is what we'll do here. CWF is messy, obviously, so put down a paper. You'll need a small, cheap paint brush, a tiny bowl and tiny spoon or something to stir with, and a small amount of water. I just use the spoon to add a little water at a time, but an eye dropper would be ideal. You will also need somewhere to put the fins as they dry. Some people push pins into the root edge of the fin - that's the edge which you glue to the rocket. They use the pins to hold the fins like a popsicle, then push the pins into some foam to let the fins dry. It's important to do both sides of the fin quickly and evenly, in this case. The water in the CWF will cause the fins to warp if you don't act quickly. I have found that my fins sometimes warp even if I do this "correctly." So I get out some parchment paper and the Riverside Shakespeare. You're going to thin the CWF a bit - there are different ratios, and I just kind of eyeball it, but Chris Michielssen has a formula that he says works every time. Check that out if you want to make sure to get good results. Brush the CWF onto the fins, on all edges, except for the root edge (well, that's what they say. But I get CFW on root edges all the time. I just sand it off). I've heard that you go with the grain, or against the grain, or one way first and then the other way. I haven't figured out which way is best. But I'm going to put on several coats, so I don't know how much that really matters. Paint the CWF onto both sides, and either stick your pins into your foam, or put the fins between the sheets of parchment and put Shakespeare on top. If you do press your fins between books, it will take a little longer to dry, but I find that after about 45 minutes to an hour, enough moisture has wicked away from the fins that I can take the book off, peel the fins from the parchment, and let them air dry, without any warping. Let these fins dry completely. I usually let them dry for a couple of hours to overnight. Once they're really dry, it's time to sand them smooth. In Part 3, we'll finish the fins and move on to the airframe and the motor mount. I made a couple exciting discoveries tonight, but I need to take pictures before I write about it. In the meantime, here's an album of a build I did. This was my third build, the Estes Mini Honest John, a scale model of the first missile to carry a nuclear payload in the U.S. arsenal. I'm not terribly interested in military scale models, but this looked cute in the package (it was so tiny! ), and it was cheap, and I needed a cheap rocket to practice a few techniques I was just learning. You'll see where I made a couple mistakes, and how I corrected them. I finished building this rocket some time last month. I just whipped up my own rocket design. You know, no big deal. This is a major goal of getting into rocketry - designing and making your own rockets. "Scratchbuilt," they call it. I found the idea really appealing, but kind of daunting. Where to start? What is it going to look like? What's it supposed to do? Won't my rockets look like any generic rocket (for fellow n00bs, a common term is "three fins and a nose cone," or 3NFC)? Well, I just finished reading the book I mentioned in my last post, Make: Rockets: Down-to-Earth Rocket Science, by Mike Westerfield, which was really good. There were a few things the author didn't talk about, which I wish had been in the book, and maybe I'll do a review of those things in another post. But it was really helpful. Throughout the book, you use parts to make semi-scratchbuilt rockets. I say "semi-" because they are of the author's design, but the point is that they aren't from kits. Some are more complicated than others, and by the end of the book, you have some basic skills to start designing your own, and the final project is to do so. This is where rocket simulator software comes in. While it's possible to design a rocket on paper, it's complicated. It requires some drawing skill, but if you want to know anything about the rocket's stability or how it will perform, it also requires some advanced mathematical skills. The software walks you through the drawing phase, and does the calculations for you. 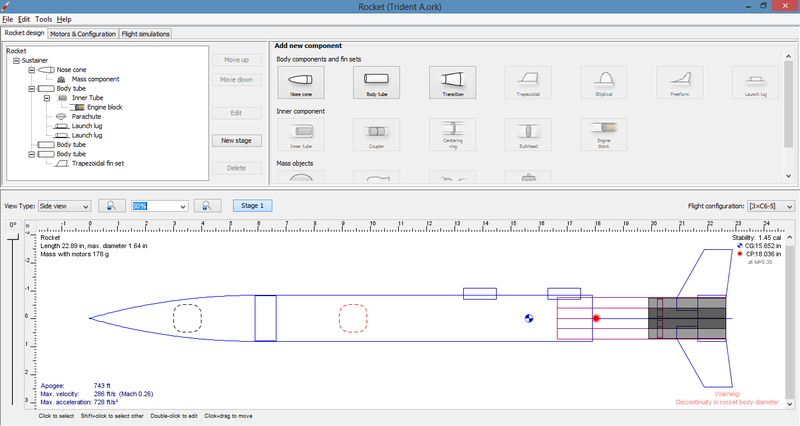 There are a number of rocket design and simulation programs, but two of the most popular are RockSim and OpenRocket. 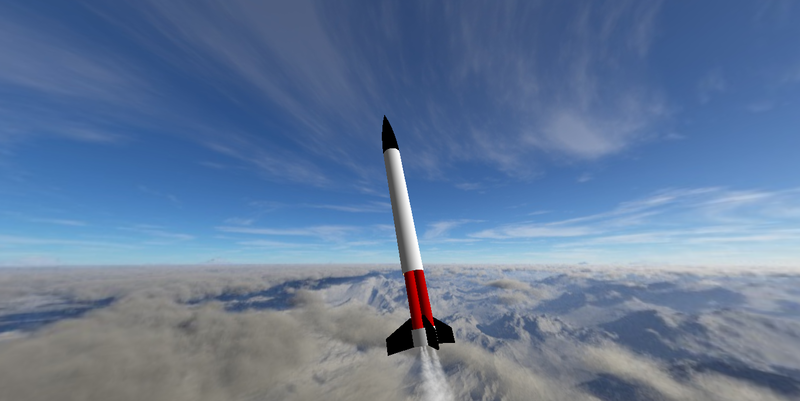 RockSim is from Apogee Components, and is the most sophisticated, most popular, and probably most useful rocket simulator. It's also over $120 currently. But it can handle almost all rocket design problems, and I believe it even runs animated simulations. If you're really into rocketry, my understanding is it's worth the investment. They even offer a free 30-day trial of the software. I plan on getting it, but I'm not there yet. OpenRocket is also very good - and it's free! The other day, I discovered that OpenRocket could read RockSim files, and my mind blew up! For one thing, there are libraries of Rocksim files for Estes rockets which you can download. That way, you'll know where the center of gravity and center of pressure are, and you can run simulated launches using different motors and under different weather conditions - even at different elevations above sea level. I thought that without Rocksim, I wouldn't be able to view these - I was wrong! Here's the rocket I designed today. It's called the Trident 1A. As you can see, I was ambitious - I designed a three-engine cluster vehicle with exposed motor tubes. What's missing from this image is the engine mounting rings and bulkhead - I cannot figure out how to install these in OpenRocket. Even the author's cluster design was missing this part, so perhaps it's not possible. I also had to trick the software a bit to get that ring on the end. That's a body tube, and in order to get it there, I had to put another body tube length between the front tube and the end ring - but with a diameter and mass of 0. That's why you see that warning in the bottom right hand corner about "Discontinuity in rocket body diameter." Look closely at the picture - from the simulation, you can see that the rocket should go nearly 750 feet into the air and hit a top velocity of 256 feet per second - that's 195 miles per hour. You start designing at the front of the rocket with the nose cone, and add components as you go back. When you're done, the software can create a PDF of component parts. Which means you can take your design, print it out, trace parts such as fins onto balsa wood, and cut them to the right size. Essentially, you've created your own kit - that's what scratchbuilding is. I haven't built this yet, and I have a lot of stuff on my to-build list, so it may be a while before I get to this. But I think this is not a bad design for a rocket n00b, eh? What do you think? One thing I have to think a lot about before I build this, though... With those exposed tubes in red, the white body, and the black fins with a fin tab on front - I've created kind of a painting nightmare. I have no idea how I'm going to mask this thing so I don't get paint where I don't want it! Any ideas, please comment below! Last Saturday's launch went really well, and it was a lot of fun. Weather was perfect, and I prepped all my rockets before leaving the house, so people didn't have to wait around a lot for us to get stuff ready. I did a total of 7 launches, including my two new rockets - the Estes Cosmic Explorer and Estes Hi Flier. Chad lost one rocket - his two-stage Estes Taser Twin. He'd lost one of these already, and this was only the second time he'd launched his new one - it ended up in a field of tall scrub beyond a barbed wire fence. It was a great flight, though. As it descended from the sky, the streamer looked like a flame set against the setting sun. I messed up the final paint job on my Cosmic Explorer, but the thing flew really well, and descended smoothly and beautifully. This might be because I cut a spill hole in the center of the giant parachute, so it was nice and stable coming down. At dinner afterwards, I learned that a local community college holds a class on model rocketry - essentially a camp for kids - and that they might be looking for a teacher. I might be a rocket n00b, but I have learned a lot in the last two months, and I'm going to look into doing this. It would be fun, and my girlfriend would see my rocketry as a worthwhile pursuit, rather than some nerdy obsession I've gotten into for some reason. Speaking of learning a lot, I have to recommend a book to my fellow rocket n00bs. 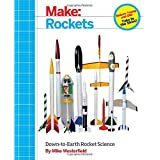 I'm currently reading a new model rocketry book called Make: Rockets: Down-to-Earth Rocket Science, by Mike Westerfield. It is due out in paperback on September 22, but you can already get it for Kindle. This book is from the publishers of the DIY magazine MAKE, and it's really great. The author starts you off building rockets right away, and rather than using kits, he gives you plans and parts lists, so you are essentially making a scratch-built rocket. There are some cool chapters on payload sections, cluster launches, and even building your own launch pad and launch controller - a project I really want to undertake, especially since I'm about to start building my own cluster rockets. Also, Chad just got the Apogee Aspire rocket, which can go over a mile high - or achieve supersonic speeds - but uses an F composite engine, and our little Estes launch controllers just won't handle that! Back to the book: All the original designs in this book have great, Greco-Roman names, like Juno, Ceres, Cerberus, etc., and there is a lot of actual science for those who are interested. I'm helping Chad assemble his Aspire rocket, and am using the guillotine fin jig for the first time. I stayed up past 2 a.m. last night finishing my two new rockets, and today's launch day! I made some critical mistakes with the finish of the Cosmic Explorer (pics later), but the thing is ready to fly. It's T-Minus 32 minutes, and I can't wait! I just about had a heart attack! I had just finished painting the second ring stripe around the body tube of my Cosmic Explorer, and was moving my painting rig, when suddenly it broke, and the rocket - with fresh paint on it - took a tumble. "Oh, no, no, NO, NO, NO!!!" I screamed, and made a grab for it. The paint did not touch anything, and the end of the tube did not get damaged (I don't currently have the nose on it since I'm painting). The ring stripe looks great. Update and pictures later. We have a launch scheduled for Saturday at 6 p.m. - looks like the weather is going to be perfect. In the low 60's, not too humid, only a few clouds in the sky. Should make for a good launch. When I say "we," I mean Chad and I, and the other friends we drag along to watch us launch rockets. We usually take a cooler of drinks and some snacks. This will be our first launch where we won't be sweating through our sun screen. Problem is, it looks like I'm going to have trouble finishing my two new rockets. I've got the Estes Hi Flier painted, but I wanted to add a flat clear coat to it. A lot of sport models are pretty shiny, but since I've gone for a Blue Angels theme on this one, and it's a small rocket, I'd like it to have a flat finish - flat finishes tend to make the rocket look a little bigger. But the humidity today was at 80%, and tomorrow it looks like it will be about 75% - pleasant, but the clear coat I have calls for painting in no higher than 65% humidity. I don't want to go against this instruction, since I'm worried it might fog the clear coat, and ruin the look of the rocket - and I've been working on this one for over three weeks. You can't tell from the lighting, but that's gloss paint, and it looks rather shiny - even though I haven't really perfected getting a super smooth finish on it. I like this paint scheme, but now that I've got the rocket together, it does look a little plain. If I were to do it over, I might do one or two rings of gold around the body tube a half inch or so below the nose cone. On a sport model like this one and the Cosmic Explorer, details in paint as well as decals help to break up the monotony of a single color. It's a pretty color, but see how boring the rocket would have looked if I'd left it all one color? This makes it look like a toy - the kind made by Santa's elves in one of those claymation Christmas specials - instead of a badass death machine. The problem with my Cosmic Explorer is a different one. It comes with decals to apply thin red lines on the fins, around the body, and down the length of the body, in addition to a logo decal to be applied in the center. Instead of decals, for the stripes, I opted to mask off the body and use red paint. When you're as much of a n00b as I am, decals are tricky to get on straight, and I can remove and adjust masking tape until I'm satisfied I've got everything where I want it. Decals can also break easily - especially long, skinny ones. You can fix that, but I'm just not that skilled yet. Also, a line of paint is less likely to flake off. The Cosmic Explorer is supposed to have one red ring stripe around the tube halfway up, and one down either of two opposing sides. But I decided it might look even better with two ring stripes. I got the first one in place, and it looks pretty nice. But before I mask off the second stripe, I need to let this dry over night. I could, of course, just skip the second stripe, but I have already decided I want it - note my comment above about the details breaking up the monotony of a single color, and adding interest to the rocket's appearance. Once that is dry, I need to do the two stripes up the side - which will be its own challenge, since I'll have to do a long, narrow mask for a line 1/8 inch wide nearly 12 inches long, down the airframe and between two fins for each line. Then I'll need to apply that compass logo sticker. And I have a few smudges on the body that I want to see if I can remove with a bit of light wet sanding before I do that. And then, I'd like to apply a gloss clear coat, to seal everything together and protect the decal. I've thought of launching these rockets as-is, and (if they survive) finishing them afterwards. But I take pride in my craftsmanship (not that I'm a great craftsman, but I'm working on that), and I hate to present an unfinished rocket. And if I lose the rocket, then I won't get to finish it the way I want before it flies again. The Cosmic Explorer also has airfoiled fins - my first time really doing that - and might well chip upon landing after the first flight - a risk I was willing to take in order to make this rocket look and perform as well as it might, and to learn the skill of airfoiling fins. Some people would perhaps say "What's the point of going through all that work if you might end up losing the rocket anyway?" But, for me, the building process is part of the point. I'm not just throwing these together to get them into the sky. I enjoy the craft of making these look right. This is a craft, like any other, and as in any craft, while I do have an end product in mind, if I didn't enjoy the process of crafting the rocket, I'd just buy some ready-mades and launch them. Chad has lost 16-18 rockets this summer - that's like $400 worth of rockets! I haven't lost one yet, but there's always a first time. We constantly joke at our launches about "hubris." I need to get him a t-shirt that says "#YOLO - You Only Launch Once." Of the two rockets, the Hi Flier is closest to finish, so I'll almost certainly launch that one on Saturday. But I'm going to try my hardest to finish this Cosmic Explorer without cutting corners. I really want to see this rocket go up. I've been working on it one for even longer than the Hi Flier! And I really want something new to launch - all my others have already gone up multiple times. It's been weeks since I've launched. I can't wait for Saturday! I built the guillotine fin jig today, which was very easy, and I can't wait to use it on my next build. I tried wet sanding the paint dams (marks left from masking tape) on my Hi Flier, with 2000 grit paper - that's pretty fine. But, while it didn't really remove the dams, it did remove a touch of the blue color, and at the edge of the dams you could see a bit of gold peaking through (I'll post all the pictures later). I thought enough of this wet sanding nonsense - it's not working for me! and did a quick mask of the gold parts on one side, and retouched the rocket with blue in a few places. Fortunately, I hadn't done the whole rocket when I changed my mind. I do wish I could get less texture on my rockets. I'm told that surface prep is the key, but even when I spray a really smooth surface - a perfectly primed and sanded plastic nose cone, for example, I still get some texture. You would only know close up, by looking closely or touching it. It's not the "orange peel" people talk about with bad spray paint jobs. It's just a bit of texture. I'm looking for smooth - perfectly smooth. Perhaps I'm doing a fine job with what I have, and I'm simply expecting too much from a can of spray paint. But I suspect I can do better. I just need to crack the secret. I also masked off one of the fins and the whole body of my Cosmic Explorer so I could do the vertical fin roll stripe. It was pretty humid today - raining like crazy right now - but, I decided that for one 1/8 inch stripe, I could risk it and paint anyway. It turned out beautiful. I also masked off the red ring about halfway up the rocket, just below where the black starts. I was going to paint this tonight, but it started raining pretty hard. Anyway, I'll post more pictures of this rocket when I'm done documenting the whole build. But it's turning out really nicely. The one thing I can actually start today is assembling my guillotine fin jig. I'm excited about this thing, as it should assure that I get my fins on perfectly straight every time. But, man, I'm so close to finishing these rockets, and since it's been three weeks since I started them, I'd like to put them to bed. Some people enjoy lists, so there you go. I've been building rockets for about two months now. Unfortunately, I did not document my first build - Estes' Der Red Max. I hadn't realized how obsessed I'd get with building rockets. But with my second build, I started photographing most of what I was doing. Here's my second build - Estes' Crossfire ISX. Notice I did a different paint job than the standard - to differentiate from Chad's Crossfire. Here, you'll see my first mistakes - which I learned from, and happily did not repeat on my second build. My brakes went out when I was leaving for work this morning. I recently got my car worked on after letting it sit for about ten months, and it was so nice to be able to drive places again. The reason I mention this here is that one of the first things I thought was Dammit! I was going to go launch rockets today! My first couple of rocket launches with Chad were back when I was walking everywhere. I live on the east side of Bloomington, and we launch in a huge park on the west side. Maybe it seems silly, but once I had my car back, the most satisfying part was that I could drive myself to launches, and to the huge hardware store and Michael's Crafts across town to buy building supplies. And the weather has been so great this week! Today would have been my first time launching in weather that wasn't sweltering and humid. I hate hot weather, especially humid weather. September and October are the perfect months for me in the Midwest. This indicates how awesome launching rockets is - I'm willing to slather on sunscreen and stand out in humid, 90-degree weather just to watch them go up. I've gotten used to walking everywhere over the last year - I didn't even mind the polar vortex, because I bundled up tight, popped in the earbuds, and listened to podcasts during the 40-minute, 4:30 a.m. walk to work five days a week. But this... This is a bummer. I'm nearly finished painting and building my two most recent rockets - the Estes Cosmic Explorer and Estes Hi Flier. I just need to do some sanding on the paint job of the Hi Flier to knock down some tape dams - raised areas of paint caused by masking tape - and do topcoats and decals for the Cosmic Explorer, and I'm done. I've been working on these rockets for three weeks now, carefully trying to get details right, fill wood grain properly, and fixing a few things I messed up. I'm still working on the details of making a rocket look as good as it can. But this workday - and the walk home - were so long, I might have to lie down before doing any sanding or painting. I want to get right to work on these, but I think I get sloppy when I'm too tired. I'm working on being patient to get the best results. But I'll probably skip the sticker. I am not a huge fan of self-adhesive stickers, and I usually get them on crooked, and there they stay. the rocket. I'll post pictures of the whole thing when I'm done. It really feels like September now! It would be great launching weather, but the field where I fly is swarming with soccer kids this weekend. But it's a great day for painting! The last couple weeks, it's been humid or rainy in central Indiana, so I've had to wait. And I've been working on two simple rockets for about three weeks or more (these are only Skill Level 1 rockets, but I've been trying to take my time and get the details the way I want them), and I'd like to put these guys to bed. I did another primer layer on my Estes Cosmic Explorer and noticed some of the carpenter's wood filler (CWF) in the body tube spirals hadn't been all sanded off, but since I've had problems over-sanding and scuffing up the body of the rocket, I decided that was OK for now. And I started the top coats of paint on my Estes Hi Flier - which I am not doing in the standard colors on the package. I've opted for blue and gold, a kind of Blue Angels theme. Chad already has one of these anyway, and when we both have the same rocket, I like to make mine look different from his. 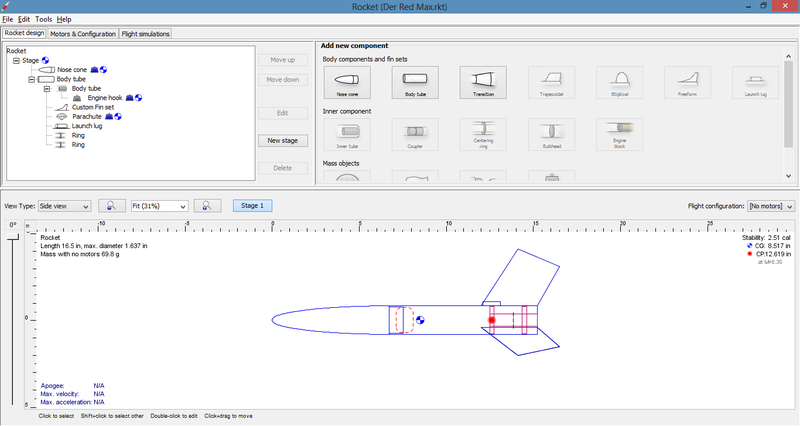 I created a new page on the basics of how model rockets work so I can freely write posts in this blog without feeling I need to explain everything. You can find it in the side bar, or just click here. The Rocketry Forum is such an awesome website, and such a good resource, especially for rocket n00bs like myself. I posted a thread about my frustrations with surface preparation I mentioned here yesterday, and got tons of advice and help. I already feel like I have a better grip on what I did wrong on this build. This forum is a really supportive community of people who are obsessed with rocket building, which I need, because most of my friends don't really care. I am actively trying to find some nerd to discuss rockets with, especially since my rocket buddy Chad will be moving to upstate New York for most of the year - and he doesn't really care about the finer points of rocket construction, anyway. But at least I can talk to him about it, and when I build a really nice looking rocket, he appreciates its quality. I talk my girlfriend's ear off about my rocket building. She's very kind about it, and listens, and even offers some advice, but she really doesn't care about the whole thing. She's just glad I've found something I'm passionate about, and doesn't complain too much about the clutter on the dining room table - unless it's there for too many days in a row. For now, I'll settle for this awesome online community. Check it out, fellow rocket n00bs. It's really helpful. I already feel like an expert at things I knew nothing about a month ago. I'm in the process of building my fourth and fifth rockets, and man, am I frustrated. Not with the basics - I got that bit down. I know how to assemble a rocket, and I've made a couple cool ones that turned out really well. If the average person looks at them, they won't notice the flaws that are bothering me so much. What has me super frustrated is my finishing technique. There are lots of rocket builders out there who get the most amazing finises on their rockets. I mean, these things are basically made out of cardboard and balsa wood (which is really grainy wood), but some people make them shiny and smooth like sports cars! I've been working on getting my rockets smooth, and trying to get some of them shiny (shiny isn't always what you want - real NASA rockets are not shiny, for example; they're flat. ), and all of them smooth. Part of this is for aerodynamics. A smooth rocket has less drag. But for these little models, that's maybe less important than for a high powered rocket. Still, for me, it's the craft of making a really nice looking rocket that is so satisfying. I've been told by a few people on The Rocketry Forum "calm down. When you're on the flying field, nobody's going to notice." Which is true. But to me, a nicely built rocket is more than a thing that will go up and come down. They all do that, if you follow the instructions and build them with just a tiny bit of competence. For me, though, a nice rocket has a sculptural quality. They're beautiful. And I know the flaws are there when I build a rocket. So, for fellow rocket n00bs: the body of the rocket is made out of a rolled paper tube - a kind of carboardy thing that looks a bit like a paper towel tube, but nicer, and usually with a waxy coating. But, you know those spiral grooves on a paper towel tube? Those are still there in rocket body tubes. A lot of people who put care into their rockets fill these in before painting, because they will show through the paint job. Not a huge deal, but if you know you can get rid of them, and make the rocket look like it's not made of cardboard, it's pretty cool. A lot of people use a wood putty like Elmer's Wood Filler. This is also great for covering up the wood grain on those balsa wood fins (another thing I haven't gotten totally down). You fill the grooves with a little of this putty, maybe thinning it out first with a little bit of water. Then, when it's dry, you sand it off, and the whole body is smooth and even, and then you put on primer and paint. Problem is, when I sand down my fillers, I seem to oversand. Like, I scuff up the body tube and get all these... fuzzy bits... that drive me... crazy. Then, they will never go away, and your rocket has little hairs on it once it's primed, sanded and painted. I thought I'd figured out a workaround. On this little rocket I'm building now - an Estes Hi Flier, which is supposed to go up to about 1600 feet - I primed the rocket first. Then, I applied filler. Then I sanded the filler and primer together last night. I figured the primer would act as a nice buffer to prevent me from shredding the paper in the body tube. Today, I thought I'd try to make the rocket a touch smoother by wet sanding with a little 400 grit sandpaper - this is pretty fine, for you fellow n00bs - and I did it again!! Look closely - you'll see the shredded paper from the tube. This drives me so crazy! I was so careful - I barely touched the thing!! I thought, well fine, this rocket will just have a few fuzzies. So, I went on to putting on a layer of white primer over the sanded gray primer, and discovered that the filler hadn't even filled in all the grooves properly! It's fine. It's OK. The rocket will still look good. This little filling-after-priming trick of mine feels like a cheat anyway. Not that there's any such thing as cheating; in rocketry, if something works, you do it. But lots of other people seem to be able to fill and sand their body tubes with nothing on them, and get decent surface to paint onto. A guy I've talked to online says he doesn't even bother filling in the spirals on a small rocket - but that guy builds the most beautiful high powered rockets, so I can see why he wouldn't bother when he puts together the little paper ones, because he knows he can do it if he wants to. For me, this is part of the learning process, so that I can build up to something bigger, and I'm trying to get this craft down. I've built several rockets now, and learned a lot, and improved my skills at certain things, but this one area... just has me stumped! Why I'm super excited: I just got my first shipment from Apogee Components, a great model rocket supply company. If you're a n00b like me, you should check it out, if only for all the great instructional newsletters and videos on the site. A week ago, I got my first non-Estes rocket, a beaut from 3D Rocketry called the Nautilus II. It was really well packed, but the US Postal Service crushed the box a little bit, and upon close inspection, the body tube had been slightly crimped in the middle. So, I ordered replacements from Apogee. I also ordered the coolest thing: a guillotine fin jig. This thing helps eliminate crooked fins, and keeps you from having to hold them in place with your hands until the glue sets. It accommodates lots of sizes of tubes and thicknesses of fins, and it's a masterpiece of rocket building equipment design. The box from Apogee was really well packed, and even included a free instructional DVD on the basics of model rocketry. Apparently, you get a new DVD with each of your first four purchases over 50 bucks! I can't wait to put this fin jig together, and use it on my new 3D Rocketry Nautilus II. But before I do that, I HAVE TO STOP GETTING THESE DAMNED FUZZIES ON MY TUBES!! Since I started this blog, I've been either too tired from work, or too busy working on or reading about rockets to actually post anything. And I've gone from knowing nothing and having done nothing to acquiring a lot of new knowledge and having done a lot of stuff, and it kind of reminds me of when I've written in journals every day for weeks, and then stopped. Then a lot of stuff happens. Then I think, Do I do a recap? For, like, posterity? Well, I'll probably get to that. Since I don't know who, if anyone, will actually read this, and a lot of people I've told about my rocket obsession have a lot of questions - "How do they, like, work?" "Do you, like, throw them away after you launch them?" - I'll probably start simply. Apologies to any advanced rocketeers (yes, that's what they're called) who stumble upon this blog in the early stages. I'll get more technical as I go on. Anyway, since this is a rocket blog, I should probably start by showing you some rockets. These are the ones that I first bought. Just to kick things off. My first few were ready-made rockets which required little or no assembly. The very first was part of what's called a "launch set." This includes a launch pad, a launch controller (a little electronic box with a couple of buttons on it you push to make the rocket launch), plus an easy-to-assemble rocket, all for less than the price of a pad and a controller you'd buy separately. I got this exact one as a kid, and never put it together. Also, one of the fins fell off a few days ago. Anyway, not to complain. It's a cheap kit I got for about 20 bucks and I've used the launch pad for much cooler rockets since. Next, I found a bunch of premade rockets on clearance at a Michael's Crafts here in town. This was before I became obsessed with building my own. These are all Estes rockets. For years, Estes was one of maybe two or three model rocket companies, and they're still probably the best known. Today, if you're starting out, and Googling "model rocket," Estes is about all you'll encounter at first. But as I've discovered, there are a lot of great, non-Estes companies who also make rockets. These are actually all great, and fly really well. This is the EX-200. It's a tiny little thing, and when you load it, it's packed so tight, you think it might just explode. But it doesn't. It flies fast and straight, and pretty high, on a tiny little A motor. Cost me 4 bucks! Motors, in large part, are labeled by letters. A is the least powerful, and they go up by each letter. This is n00b information. I'll elaborate later. This is the Patriarch. 7 bucks. I love this thing. It flies really straight, and it's heavier, so you can really watch it ascend. Some of the lighter ones go really high, but in less than a second it's so high you can't see it any more. I nearly lost this one on the first launch, because the shock cord (which holds the nose cone to the body of the rocket... if you don't know, I'll explain later) wasn't securely tied. So the body came crashing down (it was fine) and the nose cone drifted across the fields on its parachute and was nearly lost, before being rescued by the 5-year-old (Cody), who was with us. Whew! Estes Athena. Awesome rocket. Flies really high. This was either 4 or 7 dollars (I forget which). The bottom sticker comes off a bit - I need to tape that down one of these days. I used this rocket for a little experiment I'll detail in a later post. Let's just say, it was a successful experiment I'm pretty proud of. This is the rocket that gave me the bug for rocket building. 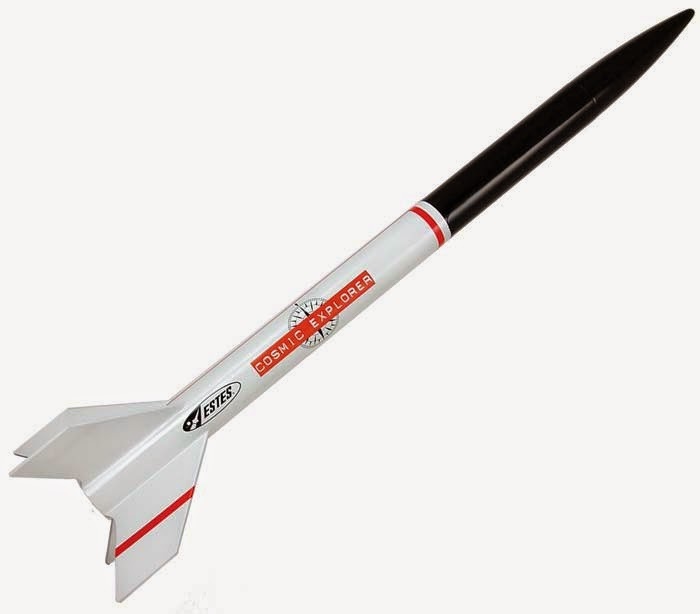 It's a re-release of a classic Estes rocket called "Der Red Max." The design is based loosely on the look of the Red Baron's airplane, and the thing is freaking cool. Nice, thick airframe. Awesome decals. Black and red look. And the ascent is awe-inspiring. The kicker is the skull-and-crossbones parachute. I saw this rocket on Amazon for about 16 or 18 bucks, and they only had one left at the time. I was worried about building my own, but it was too cool to pass up, so I bought it. I followed the instructions, and loved the process of gluing and priming and painting... I was terrified I'd get the fins on crooked - in fact, you have to look really close to see that one is slightly to the fore of the others, but it doesn't interfere with a great flight - and I was terrified of the decals. But I did some research, took my time, and it came out great. This is my baby. Here are some more views of the decals. After building this one, I started researching how to get a better finish. Up close, this rocket has a lot of texture you might not want. And you can see the wood grain in the fins. I found out that you can fill that in with a few techniques. My second build was Estes Crossfire ISX. I built this one because Chad had one, and it was the first rocket I'd launched. We lost his first one after the second launch, and Chad got a new one. I contacted Chris Michielssen of modelrocketbuilding.blogspot.com, a really gifted rocket builder, for advice on this nose cone color I had in mind. He had a tip or two, but said it would be pretty tricky. When I sent him my pictures, he posted them on his blog. I totally geeked out in nerdy pride over that one! I also rounded the leading edges of the fins and moved the launch lug (I'll explain later, fellow n00bs) for greater aerodynamic performance, so that my rocket could defeat Chad's rocket in a competition. We finally did this on Sunday, and I think they were about equal. From where I was standing, mine appeared to go a bit higher. From where others were standing, his did. But we were all really too close to the launch pad to tell. These are all "Skill Level 1" (according to Estes) rockets, which means that they require the least amount of experience building model rockets. I'm currently building two more rockets and have three I haven't started, plus one on the way in the mail. I'm just about to bump myself up a skill level, people! Well, there you have it. Rockets. I know this entry was pretty long, which is probably some kind of blogging crime, but I'm new to this. Just figured I should actually show some rockets on my new rocket blog.